If a single knock at the door sends your dog or cat scurrying under the bed or he starts barking every time the doorbell rings, it’s probably safe to say you both dread surprise guests and package deliveries, not to mention Halloween. But could it mean something’s wrong? If your dog or cat shows excessive fear toward these and other noises, like fireworks, there’s a chance he may be suffering from noise aversion. Noise aversion is a fearful or anxious response to certain sounds, such as thunderstorms, traffic, construction work, or a running vacuum. 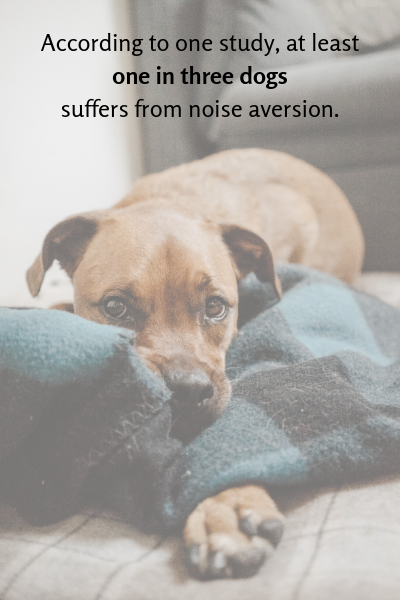 Extreme noise aversion can also cause dogs to run away, injure themselves, or damage property in an attempt to escape from the sound. Noise aversion occurs in dogs or cats of all breeds and ages. In fact, according to an online study of more than 700 dog owners, at least one in three dogs suffers from the condition. If you suspect your dog or cat is one of them, the first step is to consult with your veterinarian, who can help you pinpoint the cause and severity of your dog’s (or cat's) noise aversion—and help you develop a plan to conquer it. Going for a long walk. Encouraging your dog to release excess energy before the festivities begin will tire him out and help him relax at home. Playing at home with your kitty too! Providing a safe haven during peak trick-or-treating hours. Keeping your dog or cat in a separate room away from the front door will also prevent him from running outside, where he may become lost. Offering a distraction, such as a new toy. This can help him focus his attention on something other than the noises outside. Mask unusual sounds with white noise, TV, or soothing music. These familiar sounds can help drown out the frightening ones. Together with proper behavior training, these tricks can help make Halloween a treat for you and your dog. Contact us to find out how we can help!